When running a suite of Selenium tests, I wanted an easy way of looking at the pages visited as well as commands executed during each unit test. To solve this problem, I designed a solution built on top of the core Selenium classes that records all unit test data to a SQL Server 2008 database. Back End Design – Database schema overview. Core logic – The class that drives tracking of the test. Example Unit Test – Example of tracking a simple unit test. Not all code required to communicate with the database is listed in this post. You can either download the source from the project on SourceForge by going to https://sourceforge.net/projects/seleniumtrack/ or browse the source in the project’s SVN repository. Test Suite – All test suites executed. UnitTest – All unit tests for each test suite. CommandLog – Commands executed for each unit test. PageLog – Page or URL accessed by a command. Cookies – Cookies values, if any, available when viewing a page. There’s one main class the directs the traffic, TrackDefaultSelenium. Inheriting from DefaultSelenium, the commands start, stop, open and click are recorded. It’s here where test suites and unit test records are saved in the database. For each command targeted at the TrackDefaultSelenium class, records are saved which can be easily tied back to their respective unit tests. Constructors – Kicks off the creation of a test suite. Command Overrides – Start creates the unit test, whereas, click and open record page hits. 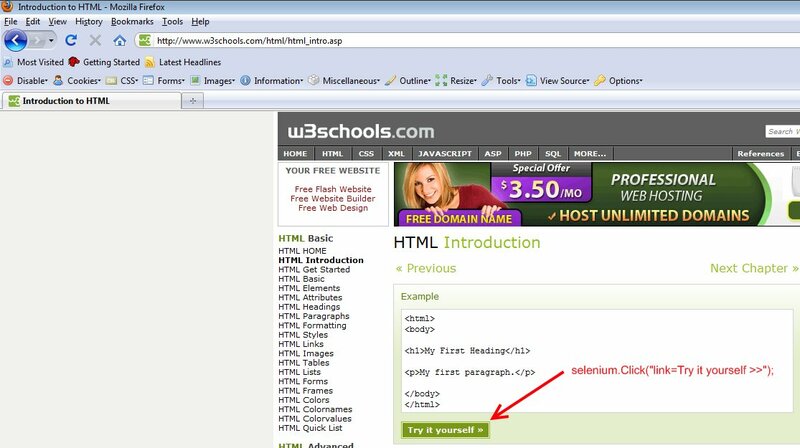 In this example, we hit a w3school’s page, check the page title and record every command directed at the Selenium server. Notice how the script matches that of one generated by the Firefox plugin. The only difference here is how we’re instantiating the Selenium object. Instead of using the DefaultSelenium object, we’re using our custom Selenium tracking object TrackDefaultSelenium. The details of this article help to get you started in accomplishing the tasks above. By default, Selenium RC runs as a stand-alone application capable of managing Selenium unit tests and directing traffic for different browser requests. 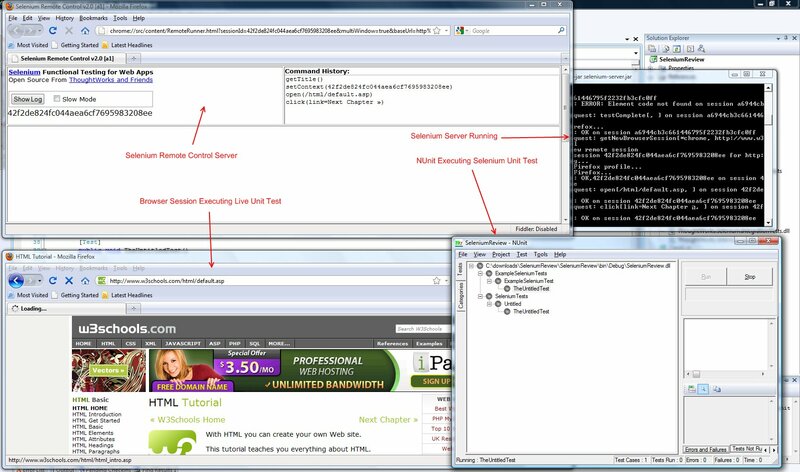 If you want to incorporate your Selenium tests into CruiseControl.Net, you have to get Selenium RC running as a service. Download a copy of the Windows Resource Kit. Now that you have the Selenium RC service created, go to Administrative Tools > Services and start the service. Check the system event logs for errors to ensure everything is working properly. When looking for a way to test our websites by using web macros, directly interacting with the rendered presentation of our sites, I ran across quite a few test suites. Both Waitr and Selenium stood out as the more stable, extensible and easy to incorporate test suites out there. 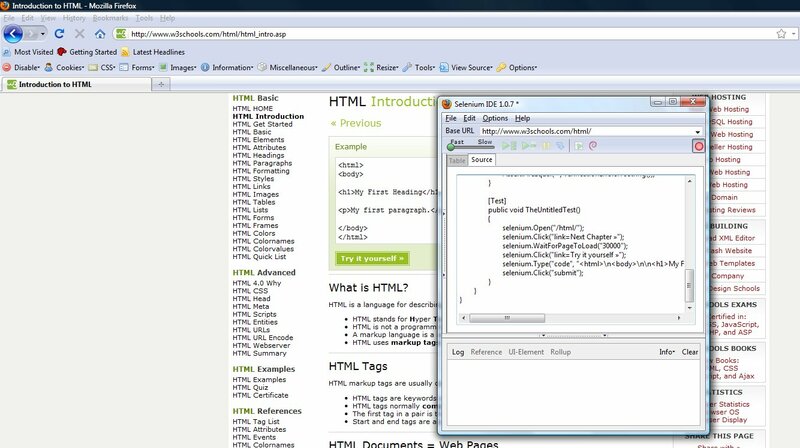 Selenium, however, seemed to offer easy implementation on a .Net platform. Once properly setup, Selenium unit tests are as easy to create as opening Firefox, browsing the site you want to test and record your unit test macro as you navigate from one page to another. 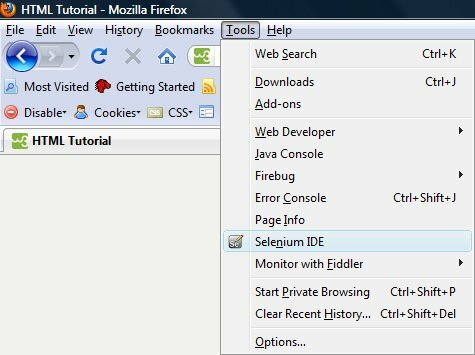 Selenium IDE – Firefox plugin used to create the unit tests. Selenium Core – Core libraries for .Net/C#. Selenium Remote Control -Allows for managing Selenium unit tests with multiple broswers simultaneously (includes the Selenium Core libraries). Selenium Grid -Load balance your tests across multiple servers. Download and install the Selenium IDE. This will add a “Selenium IDE” option under tools in your Firefox browser. Download the Selenium RC installation files and extract to a location on your test server. For this example, I extracted to c:\Selenium-Remote-Control\. 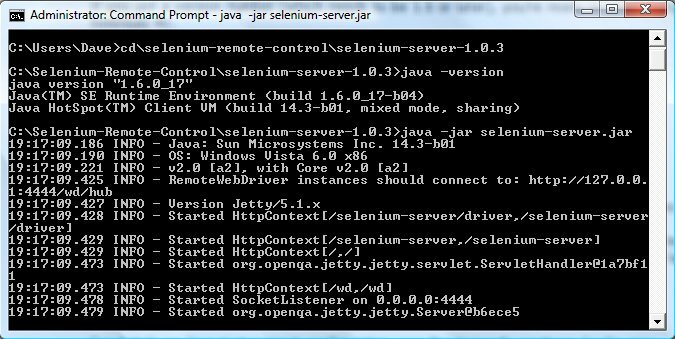 Starting the Selenium Server is as easy as running “java -jar selenium-server.jar” from the directory of your Selenium Server installation. Since this is a java-based application, you may be required to download the latest version of java prior to successfully starting the Selenium Server. If your Selenium Server output resembles something like above, then you’re in business. Installing Selenium Server is not enough. 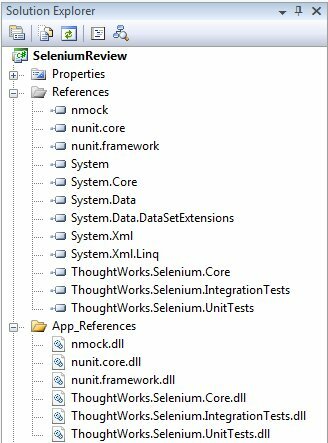 You must also install NUnit to drive the C# generated unit tests that target the Selenium server. Download the NUnit installation files and install the software to your test server. 3. Once the IDE opens, it defaults to recording every action you take on a given website. Select the output that the IDE will use to generate your unit test. For this example, we’re using C#. 4. While still within Firefox, click through the website for which you want to create a unit test. Every action you take will be recorded by the IDE, with your unit tests generated immediately. 5. When done generating your test, click on the record/stop button to end the IDE. 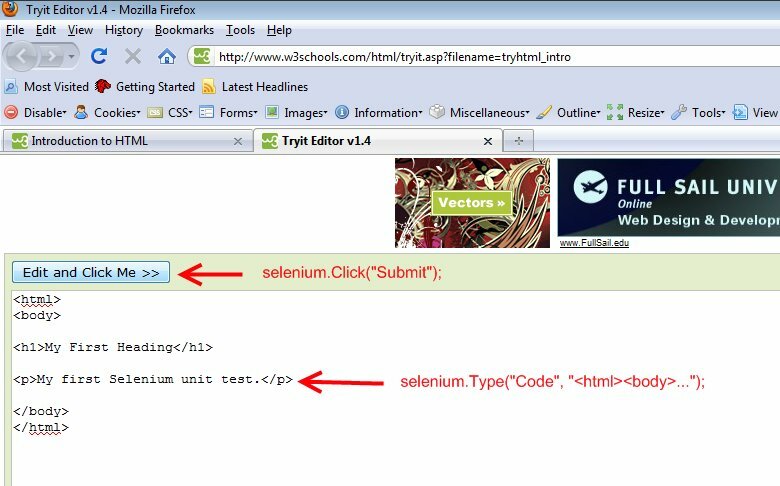 You’ll see your complete unit test within the Source tab of the Selenium IDE window. 1. 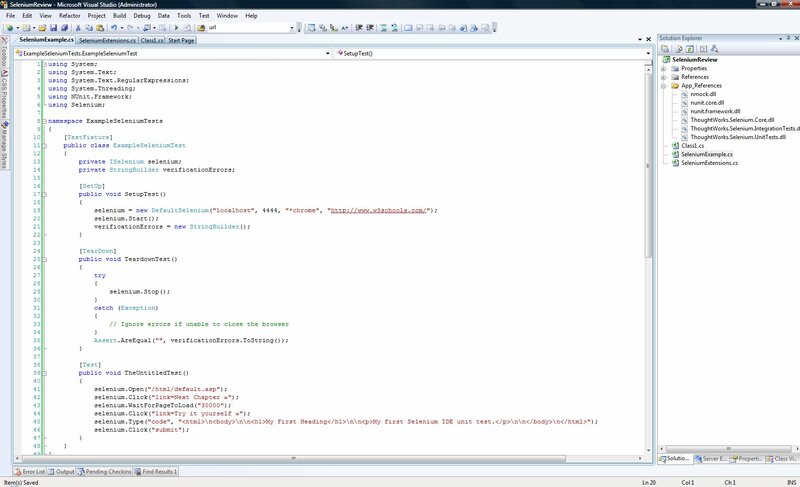 Take the C# code generated by the Selenium IDE and add it as a class to a new Visual Studio project. 4. Open NUnit. Select File > Open Project… and select the your project’s compiled assembly. 5. Within NUnit, highlight your unit test class name and click on Run. Sit back and watch the show. 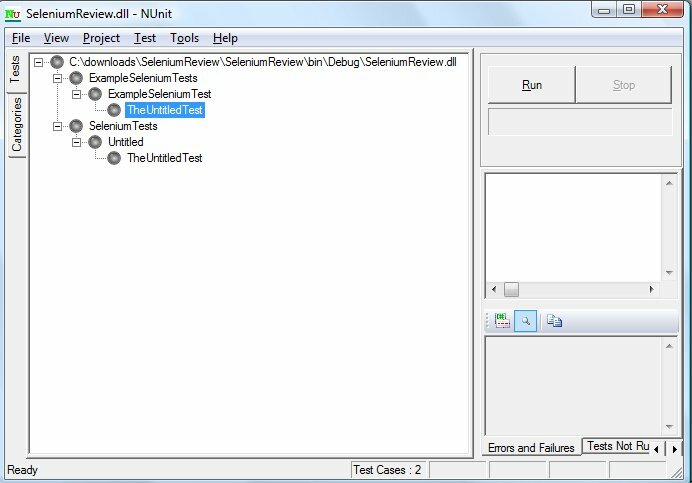 NUnit will kick off the unit test, which runs the compiled code generated by the Selenium IDE. You’ll see the Selenium Server output the commands in the command prompt window. 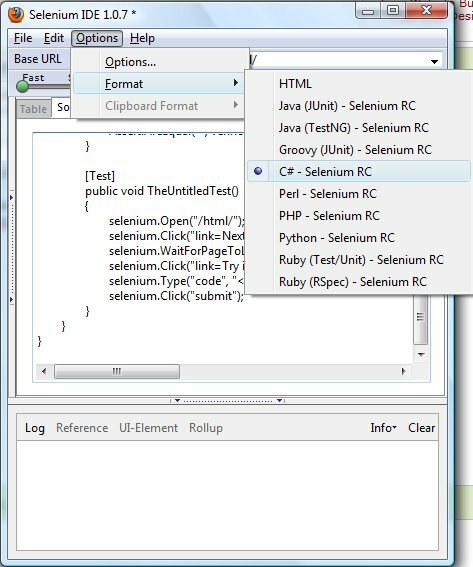 Selenium Remote Control Server then opens, which triggers the opening of a browser window to run the recorded Selenium unit test. NUnit will then report back the results of the test.